Andrea Levy’s epic, Orange Prize-winning novel Small Island bursts into new life on the Olivier Stage. A company of 40 tell a story which journeys from Jamaica to Britain through the Second World War to 1948, the year the HMT Empire Windrush docked at Tilbury. Ebonyonline.net caught up with Leah Harvey who plays Hortense, one of the four main protagonist in this huge production to talk Windrus, 50s racism, the Rock and much more. EOL: What did you know about ‘Small Island’ prior to the role? had you read the book? 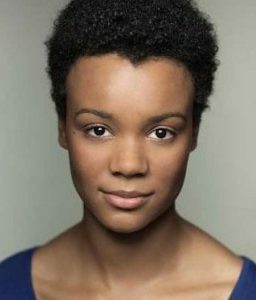 LH: Prior to landing Hortense in this production, I had auditioned for the part of July in the recent BBC adaptation of Andrea Levy’s The Long Song which Tamara Lawrance absolutely shone in. So, I was researching for The Long Song less than a year ago and that was my first introduction to Small Island. I watched the BBC series which starred Naomie Harris (who I’ve looked up to for as long as I can remember) as Hortense and loved it. Little did I know I’d be playing that part on stage less than a year later! I read the book when I got the role and I’m so glad I read it knowing I’d be playing Hortense. I learned so much! EOL: What attracted you to the role of Hortense? LH: She’s determined and ambitious and extremely funny; all of those things really drew me to her from the first time I met the character. I have always thought that it’s harder hide anguish than to show it. Hortense spends a lot of her time in the play hiding how she feels in order to hold on to what little control she has. That has been a challenge but I’m so glad I have the honour of playing her. I love a challenge! EOL: Did you bring any part of yourself/life into the part? LH: I had bring a lot of myself into this part. I researched and researched before starting rehearsals but as soon as I get her shoes on, it feels like I’m travelling back in time and I try to bring as much of my own humour and fragility to the role as if I was living it in my present. For me, I can’t be someone else, I can only be me and focus on those around me so we can tell the story together. So a lot of myself is in Hortense. EOL: It’s a very intense play, what was the relationship like in rehearsals between you and the other three main actors? LH: Within the story, there are twists and turns and extraordinary things happen to normal people but I’m going to be a bit boring and say that there has been a lot less drama between us in real life! The unending support we give to each other during rehearsals is really so special and has been a massive part of creating this play for me. Not only that but there are 24 of us in the main cast and we all get on so well and from day one it’s been the most supportive environment to work in. We are a big team of people bringing this story to life and everyone brings their bright spirit and incredible talent to every rehearsal. EOL: How did you feel learning about the shocking violent racism the Windrush generation experienced daily that the play reveals? LH: It upsets me. I often think that I would be in that position had I been born then. It’s just crazy to know that this is my grandparents generation we’re talking about. I was recently at my grandmothers 80th birthday and it hit me how much my Hortense is like her, without even being conscious of it! We are telling a story which is very much still alive. It’s not ancient history and there is still tension today. EOL: Do you think the current generation is mentally equipped to deal with increasing overt racism that is beginning to rear its ugly head once again? LH: I hope we are. I feel like the majority of the current generation have incredible amounts of empathy. We have a wealth of knowledge because the world is at our fingertips but that can have a positive or negative effect depending on the kind of information we seek. But as long as we remain empathetic and keep love in our hearts and minds then hopefully we will be equipped to deal with whatever is thrown at us. EOL: You had a role in the highly successful ‘Fighting with My Family’, did you work directly with the Rock, if so, can you spill some dirt? LH: Haha! I always get asked this! And I always have to disappoint and say that The Rock and I did not cross paths while filming! But I did have plenty of time with Stephen Merchant, who directed. Nick Frost, who is a legend and Lena Heady, who is a powerhouse and also who nursed my wisdom tooth pain with a hand massage between takes one day. Not forgetting Florence Pugh who is absolutely smashing it at the moment and I’m very proud of her! EOL: How did you catch the acting bug? LH: I played the brightest star in our Christmas show in year 2 at primary school and since then I’ve just loved performing and felt very at home dancing, singing and acting. I had a week filming my first professional job when I was 14 and from then knew that acting was the way to go as it uses every little bit of skill and you never know what you might need to learn for the next role. It’s so exciting! Finally, what advice you have for your 14-year-old self who had a role in the BBC adaptation of ‘Dustbin Baby’? LH: This makes me a little emotional…to think back to those times and see where I am now. LH: My advice would be, if you’re excited don’t be afraid to show it. That is stolen from Phyllida Lloyd who said that to me when I worked with her on the All female Shakespeare trilogy but I think it’s the most important advice I’ve ever received aside from “You have to be able to laugh at yourself” (from my dance teacher, Katie Levett). Why not give that advice to myself a few years in advance?! I’m excited to start telling the incredible story of Small Island to everyone who comes to see it. And I’ll never stop being excited about it even on our last performance in August.